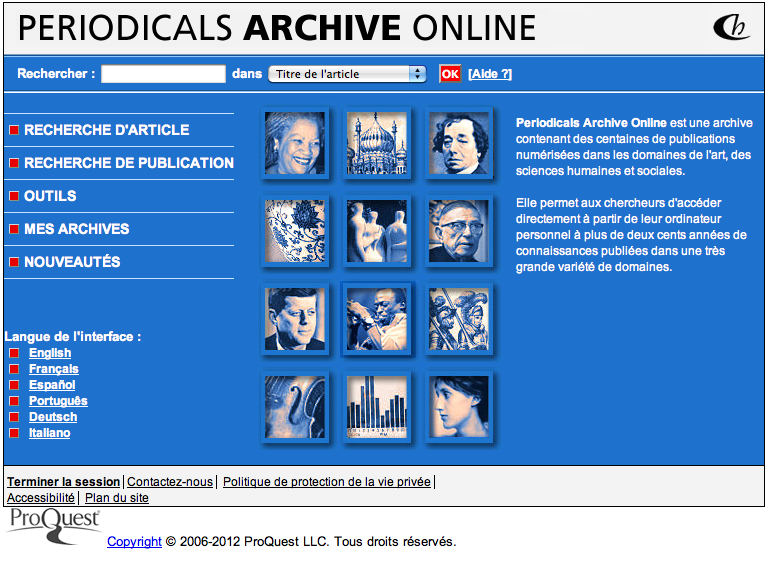 I’ve just begun exploring in one of the Library’s newer tools, Periodicals Archive Online, from ProQuest/Chadwyck Healy. It’s an index that leads to full-text articles in the arts, humanities, & social sciences. One of the first things I noticed is that you can change the search interface to one of 6 different languages, including French (below), Spanish, German, Italian, and Portuguese – and of course the default is English. This can make for a nice immersive experience for language students, and is also useful of course for researchers who prefer to search in one of these languages. So, big bonus points from the beginning from me! What breadth in terms of subject areas, in terms of international perspectives, languages, and in terms of years! Broad subjects include art; drama; history; economics; folklore; literature, poetry, and literary studies; geography; religion; psychology; linguistics & psycholinguistics; education; African American studies; law; Cuban studies; music; anthropology; philosophy; sociology, women’s studies, and more. What about years? This depends on the titles themselves, of course. I do see some titles dating back to the 19th century, such as Geographische Zeitschrift (coverage in PAO from 1895 through 2000), Nederlands archief voor kerkgeschiedenis (1885-2000), Orientalistische Literaturzeitung (1898-2000), and Proceedings of the American Antiquarian Society (1813-2000), to grab a few titles just at random. Most journals seem solidly rooted in the 20th century, with the most recent coverage year apparently 2000. The search interface does indicate you can search by date, with 1665 (!) being the first year listed through 2000. Amazing! I also definitely appreciate the built-in flexibility for researchers. PAO lets you refine or filter your search results by language, by journal, date, and by subject. Marked references can be exported into EndNote or other bibliographic management software packages. TO test drive the index, I did some sample searching totally off the top of my head. For starters, I did a search on medieval author Christine de Pisan (alternatively spelled Christine de Pizan), and found great articles in English and in French listed under both spellings. (No, Periodicals Archive Online does not seem to include images. 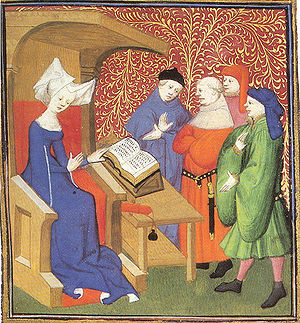 This illustration of Christine de Pisan “lecturing men” is courtesy of Wikipedia – love it!) But the index did very quickly find a number of focused and interesting full-text research articles that I wouldn’t have been able to easily find in any other single index, save for Quick Search. Aside: Pisan was one of the earliest women writers to be able to support herself and her children through her prolific writings. She was also a feminist, writing her ground-breaking Le Livre de la Cité des Dames in 1405 as a protest against the misogynistic leanings in the renowned Roman de la Rose. Well, you can see I quickly got into source material of great interest to me – which is of course the job of any good index – to get you where you want to go. Periodicals Archive Online is so flexible and so broad, it’s likely to include materials you’re interested in too. Give it a try and see where it leads you! This entry was posted in African American, American Indian, Asian American, Finding, Gender, Languages, Latino, music, World and tagged Christine de Pizan, databases, feminism, gender, humanities, international, languages, libraries, Periodicals Archive Online, social sciences, world literature by biblionotes. Bookmark the permalink.